During the Kingdom (753 BC – 509 BC), Roman food was rather simple and similar to the food in ancient Greece. The Romans then typically ate a porridge called the puls which was made of emmer, olive oil, salt, mixed with various herbs. The Romans also ate cereals, legumes, vegetables, fruits, meat, fish and seafood, and used olive oil, vinegar and salt, pepper, mint, saffron and other spices in their food. Roman cuisine evolved from one resembling ancient Greek cuisine to a very diverse cuisine thanks to Rome's expansion during the Republic and the Empire and the adoption of foreign culinary habits. As Rome expanded, the differences in eating habits between social classes became more pronounced and Roman cuisine became more sophisticated. Eating three times a day was something that was introduced by the Romans but it was only common for the upper class. Most people in the ancient world ate only once daily. Eating three times a day became common only much later in the history of Rome. Roman meals consisted of the jentaculum (breakfast), the cena (lunch) and the vesperna (dinner in the evening). Breakfast was usually light, consisting of a piece of bread with honey or cheese. Lunch was a large meal and the main meal of the day, while dinner consisted of a light supper. As Rome expanded and became more prosperous during the Republic and the Empire, more foods became available. The cena moved to the afternoon (2 - 3 p.m.) as it became larger, while the vesperna (the light supper) disappeared altogether. Lunch was replaced by the prandium which was like a light lunch. Furthermore, the cena, which initially consisted of only one course, developed into a two-course meal during the Republic: a main course and a dessert served with fruit or seafood. By the end of the Republic, it evolved into a three-course meal: the appetizer (gustatio), the main course (primae mensae) and the dessert (secundae mensae). The eating habits of average Romans were quite different from those of the upper class. As we previously pointed out, wealthy Romans ate three times daily and had a lavish dinner called the cena usually right after the afternoon visit to the baths. 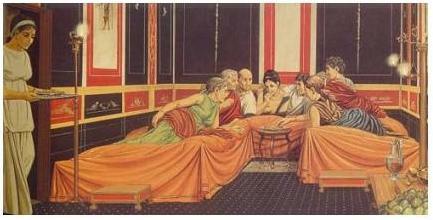 The cena could last for hours and until nighttime, and would usually be followed by drinks (comissatio in latin). In contrast, the average Romans' dinner usually consisted of a light supper early in the evening (the vesperna). 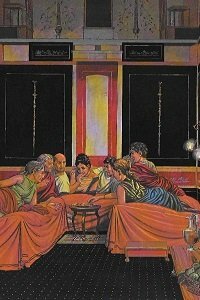 Average Romans (and slaves) ate standing up or sitting around a table while wealthy Romans ate reclined on couches in a luxurious room called the triclinium. Regular Romans could simply not afford these lavish rooms and the oil lamps necessary to light them up at night. They had to wake up early the next day to go to work and so they went to bed early. Another major difference in eating habits between the upper and the lower classes is that average Romans usually could not afford to eat meat and all the exotic foods from the provinces that rich Romans enjoyed. For example, they often ate the puls, the porridge made of emmer, salt, fat and water, with a piece of bread sprayed with a little bit of salt. Rich Romans ate the same puls but added chopped vegetables, meat, cheese and various herbs to it. Dining for the upper class was a lavish and entertaining culinary experience while for most Romans, it was just a necessity. Ancient Roman foods: how did Roman food taste like? Roman food often had a sweet and sour taste similar to today's Asian cuisines. The Romans liked to add fruits and honey (sweet taste) and vinegar (sour) to their food thereby giving it a sweet and sour taste. Roman food tasted quite different from our foods today and attemps to recreate Roman recipes have shown that Roman food was not only healthy but that it also tasted quite good! Bread: Bread was a staple food in ancient Rome consumed by all social classes. In Pompeii, over 30 bakeries and a large number of rotary mills to grind grain were found, thereby proving that Romans ate a lot of bread! Bread was often eaten with honey, olives, egg, cheese, or moretum a spread made of cheese, garlic, and various herbs. Romans often sprayed salt on their bread and also dipped their bread in wine (it was considered perfectly normal to do so). Bread was originally made of emmer (which is related to wheat) and during the Empire, Romans started making bread with wheat (just like today). Wheaten bread gradually replaced bread made of emmer. Bread tasted quite different from the bread that we eat today. Roman flour was not as pure as the one used to make bread today. It often contained lots of dust and bits which made the bread rather coarse. Over time Roman bread wore down people's teeth as Roman had to chew the bits of grain contained in it! Legumes, vegetables and fruits: The Romans cooked legumes such as beans, peas and lentils. These healthy legumes were very commonly seen on the plates of ancient Romans. They also consumed a lot of vegetables and fruits, either raw or cooked. However, many of the vegetables and fruits that we associate with Mediterranean cuisine today did not exist in ancient Rome. For example, tomatoes, potatoes and capsicum peppers, fruits and vegetables typically consumed in Italy today were introduced in Europe only after the discovery of the New World in the 1400s (note that bananas also did not arrive in Europe until the discovery of the New World). Eggplant was introduced in 600-700 AD by the Arabs. Fruits such as lemons and oranges did not exist either noting that lemons started being cultivated only during the Principate (395 – 496 CE). Think of vegetables such as cabbage, celery, kale, broccoli, radishes, asparagus, yellow squash, carrots, turnips, beets, green peas or cucumber, and fruits such as apples, figs, grapes, pears and olives, as the kinds of vegetables and fruits typically consumed by the ancient Romans. About carrots, the Romans had various kinds of carrots of various colors (extinct today) and not just orange carrots like today. Meat and fish: Fish and seafood were usually more common and more affordable than meat. Romans would cook fish (sardines, tuna, sea bass), shellfish and seafood such as octopus. Rome had lots of large fisheries and aquaculture including fish and oyster farming was a very developed industry. Poultry such as chicken and game were also common. Meat was considered a luxury and the Romans had meats such as (salted) pork and lamb while beef was less common (it was more common in ancient Greece). Wealthy Romans also ate rodents such a dormice which were considered a delicacy and a status symbol in ancient Rome. For example, wealthy Romans, in order to show off their wealth, would weigh the rodents in front of their guest before cooking. Garum: The fish sauce garum was a staple of Roman cuisine and was used in many dishes, for cooking and as a table condiment. Garum was made from the intestines of small fishes. 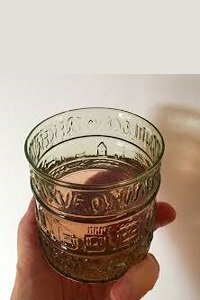 Wine: The Romans preferred alcoholic drinks to water even though they had access to rather high quality water from the aqueducts. Stored water could sometimes have a bad taste or even contain bacteria, therefore alcoholic drinks were considered safer to drink and... tastier. The Romans mostly drank wine. But they did not drink wine the way we do today: wine had a higher alcohol content and was watered down before drinking. It was actually considered barbaric to drink wine that was not diluted. The Romans also added various spices and even honey to their wine which they often served hot. It is worth noting that wine was not stored in glass bottles but in amphoras. Posca: the plebeians and the army drank a drink called posca, an alcoholic drink utterly despised by the upper class. The posca was made from acetum, a low-quality wine that almost tasted like vinegar. Spoiled wine, for example not properly stored wine that turned into vinegar, would also be used to make this ancient Roman drink. 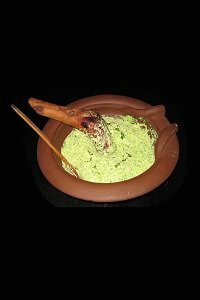 To make posca, acetum was watered down and various herbs and spices, usually crushed coriander seeds, would be added. Often honey, which made the drink sweet, was added. Beer: The Romans mostly drank wine or posca throughout the Roman Empire. However, beer (cerevisia in Latin) and honey mead were more popular in the Northern provinces. Drinking beer was considered barbaric by many in Rome and beer was often associated with the barbarians. We note that the practice of drinking milk, which is very common today, was also considered barbaric back then. Milk was only to be used to make cheeses! Drinks that did not exist: There many drinks that are regularly consumed today that simply did not exist in ancient Rome. For example coffee, a drink that is often associated with Italy, did not exist in the Roman world. Coffee appeared in Italy only in the 16th century and the tradition of coffee-drinking comes from the Arabs and started in Yemen around the 15th century AD. Actually coffee was dubbed "the Muslim drink" for a long time in Europe until it was deemed Christian by Pope Clement VIII in 1600. Tea did not exist either in ancient Rome, tea being an Asian drink introduced in Europe by the Dutch in the 17th century. Therefore, when you imagine the Roman world, imagine a world without tea, coffee, milk or orange juice. Home of well-to-do Romans initially had an open hearth called the focus which was used to cook similar to the open hearths found in medieval times homes. The focus was placed in front of the lariarium, a shrine devoted to the guardian spirits of the household: the lares and the penates. The Romans would perform daily rituals at the lararium to honor the lares who guarded homes, crossroads and the city, the lares familiaris who protected the household and ensured the continuation of the family line, and the penates, initially the gods of the floor and the larder, who also protected the household and ensured the family's welfare and prosperity. The focus was often portable, with four legs made of marble or stone and a large cauldron attached with chains above the fire, or something similar to a grill. With the beginnings of separate kitchens in the homes of wealthy Romans, the focus was solely used to make religious offerings to the lares and penates or to warm up the house. The separate kitchens found in Pompeii were usually small with a few exceptions such as the kitchen of the Villa of the Mysteries which was 3 by 12 meters (10 by 39 feet). Kitchens had small holes in the ceiling to let the smoke out or had no roof at all. They had an oven (furnus) shaped like a dome or a square made of brick and with a flat floor made of lava or granite noting that ovens were generally used to bake bread. Kitchen walls had hooks or chains to hang the cooking utensils just like kitchens today and the Ancient Romans used knives, meat forks, pans, pots, mold, jugs for measuring, graters, sieves, cheese-slicers and tongs which were crafted of bone, wood, bronze or iron. 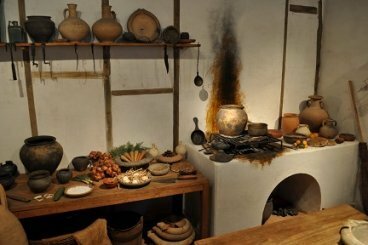 Most Romans could not afford to have a separate kitchen and kitchens and ovens were often shared. It was common to see Romans cooking in open kitchens in Roman cities and towns and Pompeii has a number of open kitchens, still visible today, with beautiful dome shaped brick ovens. How did the Romans preserve their food? Refrigerators and freezers did not exist back in the ancient world and preserving food was always a challenge. Food poisoning and death resulting from it was quite common! The Romans were quite advanced when it came to preserving their foods. Meats and fish were not frozen but smoked and salted. The salting process started with cleaning the meat using a pickling process, for example by immersing it in vinegar. The meat or fish was then dried, smoked by exposing it to smoke from burning or smoldering wood, and then salted. Fish and shellfish were also kept alive in tanks. Fruits were eaten fresh in the summer and dried in the winter. Romans did not have fruits coming from the southern hemisphere during the winter days like we have today. Food preservation was essential not only to avoid food poisoning but also in order to import foods from the provinces. The science of preserving food actually contributed to the expansion of trade during the Republic and the Empire as many of the foods imported had to be transported over long distances. For example, Brittany was known for its oysters and oysters from Brittany were kept in tanks as they were being transported to Italy. Gallia Belgica (Belgium today) was known for its delicious ham which was smoked and salted. The smoking and salting process allowed for the ham to be kept for weeks without deteriorating. Animals like wild game from Tunisia were transported on ships alive in cages. 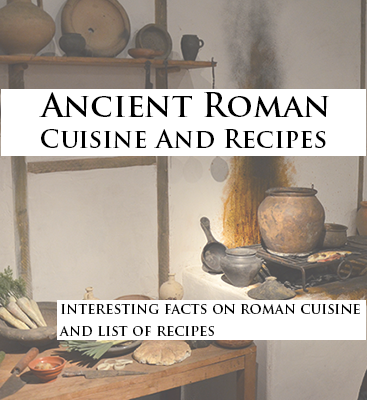 For ancient Roman recipes, take a look at our Roman cook book. A lot of the foods in ancient Rome are foods that we associate with Greece and Mediterranean cuisine today. However, vegetables and fruits that we associate with Mediterranean cuisine such as tomatoes, eggplant or lemons did not exist. Tomatoes, capsicum peppers did not exist in ancient Rome and did not arrive in Europe until the discovery of the Americas in the 1400s. Spinach, eggplant and rice did not exist either and came only in 600-700 AD. There were various kinds of carrots of various colors in ancient Rome that do not exist today. Romans had a pretty healthy diet considering that they ate a lot of fish and drank wine or posca, drinks that are full of anti-oxidants. Meats and fish were salted and smoked in order to be preserved. Fish and seafood were transported alive from far-away provinces in order to be kept fresh. Fish and seafood were cheaper than red meat and only rich people regularly ate a lot of red meat. Wine was stronger than it is today with a higher alcohol grade and was mixed with water. It was considered barbaric to drink wine that was not watered down. Some rodents such as dormice were considered a delicacy until they were banned in the first century BC. Only the upper class ate reclined on couches. Most Romans (and slaves) ate sitting or standing up. During the Roman Republic, lavish banquets were illegal and could be punished by law.